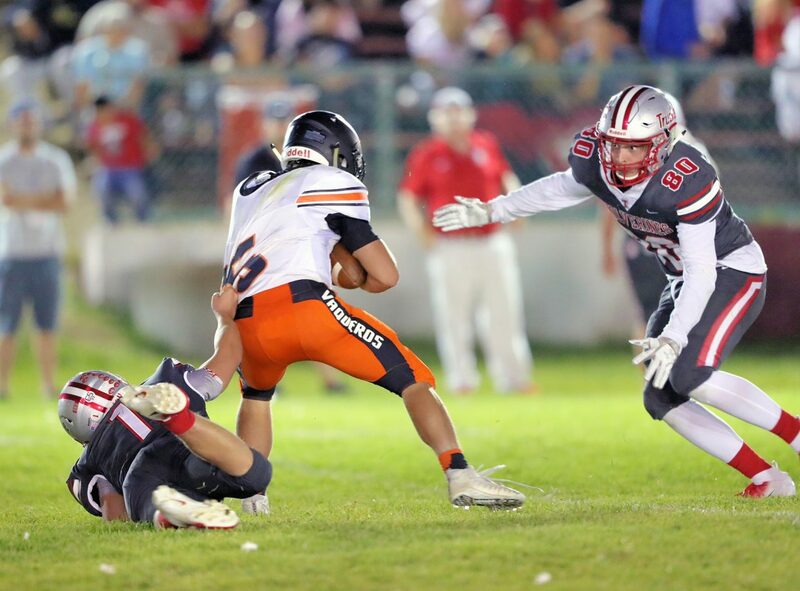 Senior linebacker Sean Kelly dives to bring down Fernley quarterback Cooper Henderson. 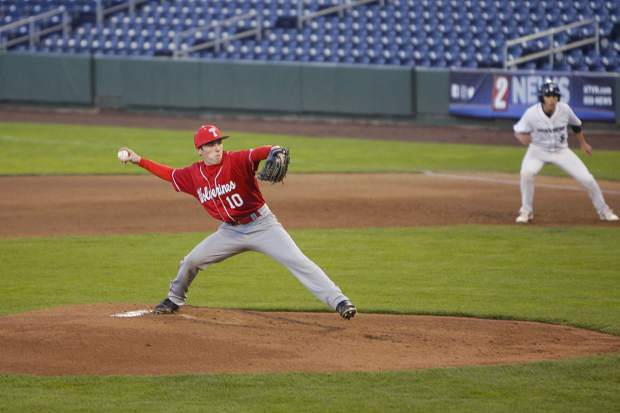 Individual StatisticsPassing: M. Bellon 7-8-2-70.Rushing: M. Trotter 9-119-1, K. Malo 9-56, J. Skaff 7-53-1, M. Bellon 7-43-1, S. Kelly 4-18, D. Laferriere 2-11, T. Estabrook 2-10, J. Streit 1-5, C. McMullen 1-2.Receiving: D. Laferriere 2-36-1, T. Estabrook 2-17, M. Bellon 1-13, K. Malo 2-11-1, M. Trotter 1-6. 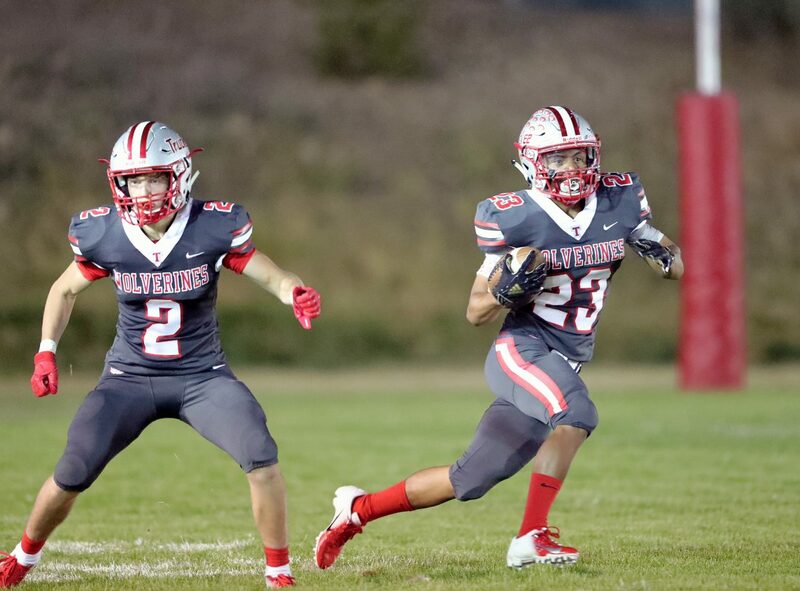 It wasn’t the prettiest of games, but the Truckee Wolverines football team put the rest of Class 3A on notice Saturday night, knocking off the defending Northern League champions, Fernley, in the season opener. 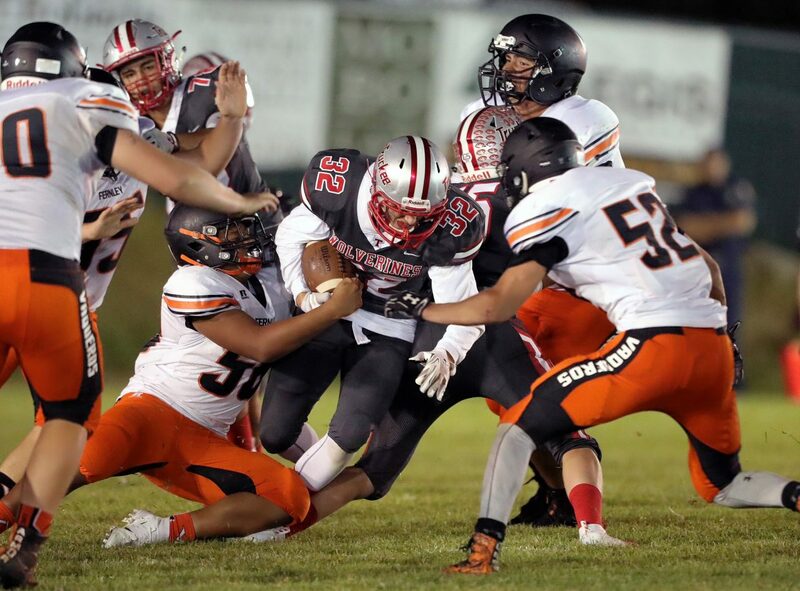 Truckee handed the Vaqueros a 34-17 defeat in the first ever Saturday night game at Surprise Stadium, ending the Fernley program’s 10-game winning streak in regular season league games. 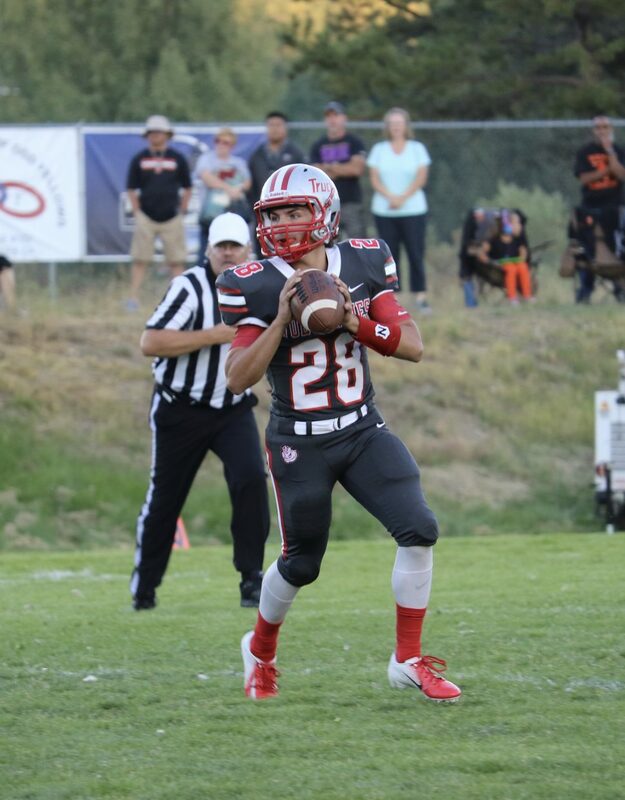 Truckee was also the last team to beat Fernley in a regular season league game, doing so to end the 2016 season. 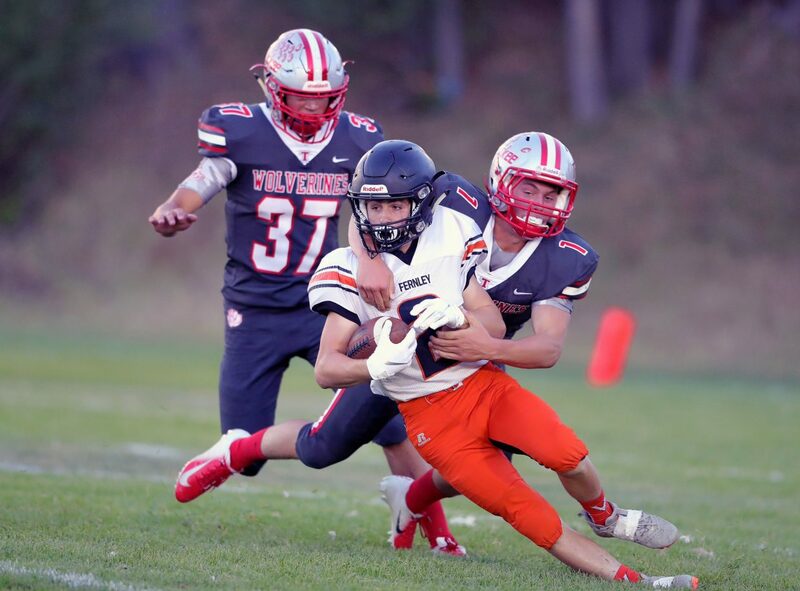 Though the team picked up an important league win to open the season, Head Coach Josh Ivens and members of the Wolverines, weren’t satisfied by the performance, which included a pair of lost fumbles in the second half. 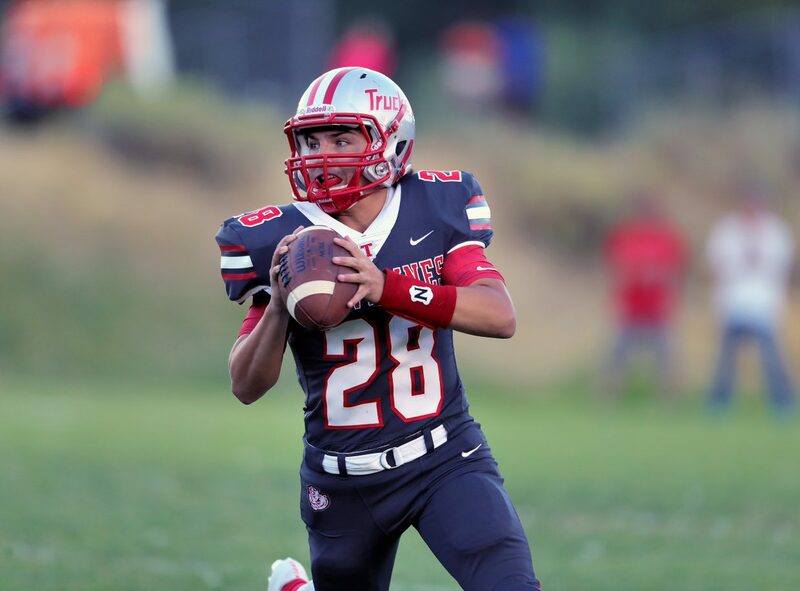 Truckee opened the game well, dominating the first half with big plays on the ground and through the air. Senior Sean Kelly ripped the Vaqueros for 20 yards on the first drive, which was then capped by a 32-yard touchdown pass from senior quarterback Marcus Bellon to senior Derek Laferriere. 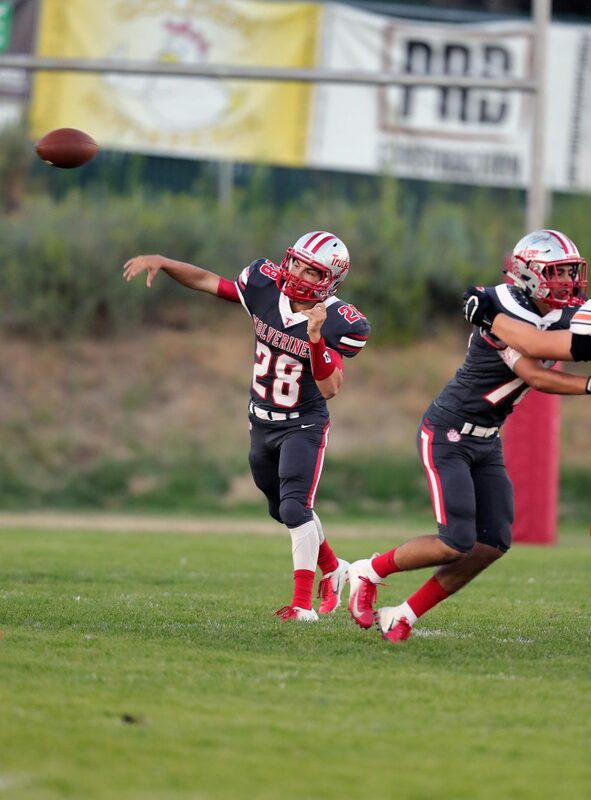 Senior kicker Emmanuel Valenzuela-Jones added the extra point for a 7-0 advantage. 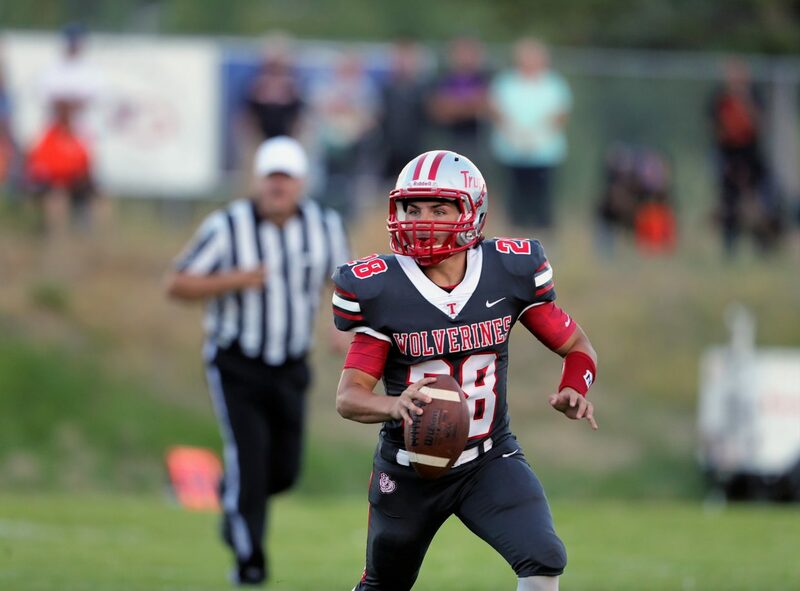 After each team was forced to punt, Fernley got on the board to close the first quarter, converting a fourth down and scoring off a 36-yard touchdown pass from senior Cooper Henderson to senior receiver Vincent Nguyen. The ensuing extra point left the game tied. 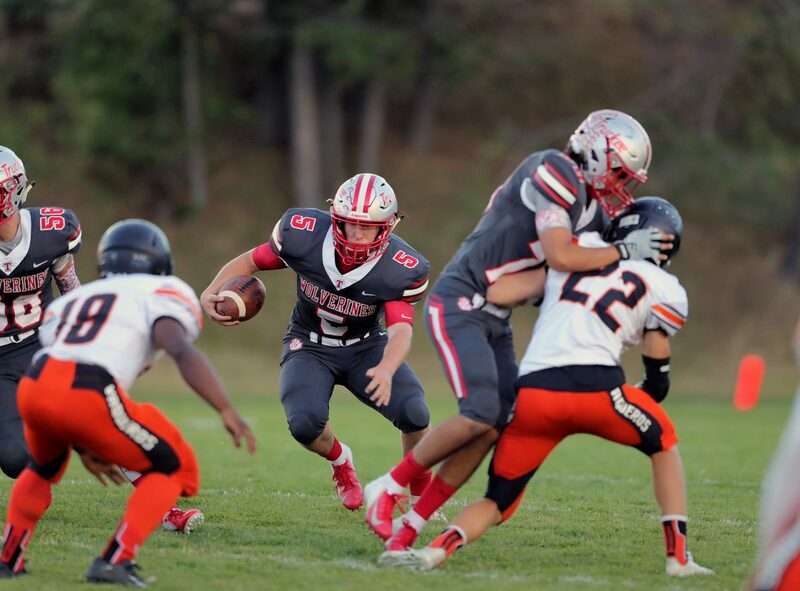 Truckee answered on the following drive, which was set up by Bellon eluding the defense on a third-and-15 play for a first down. 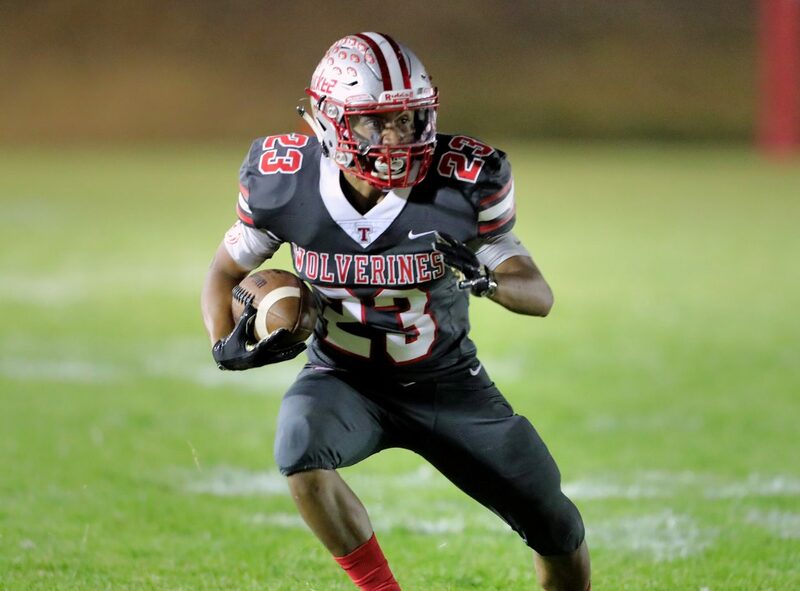 Senior Marcus Trotter then gashed the Vaqueros for 54 yards and a touchdown to put the Wolverines up 14-7 after Valenzuela-Jones’ extra point. 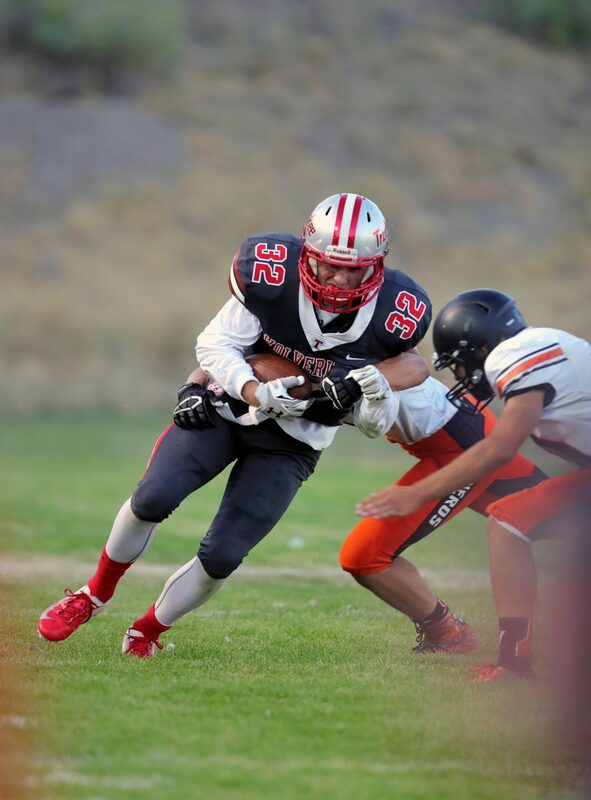 Fernley converted again on fourth down on its next drive, followed by a 25-yard run from Henderson. 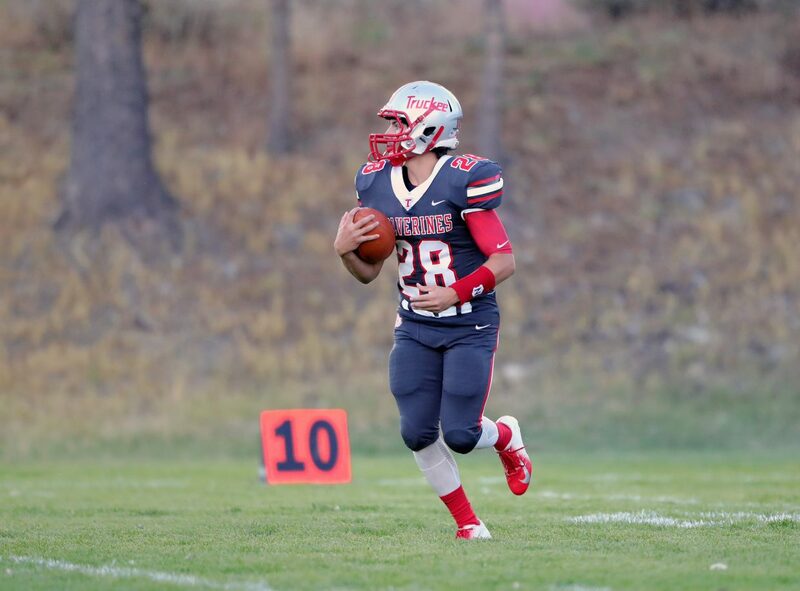 Truckee’s defense would limit the damage, holding the Vaqueros to a field goal. Bellon quickly led the offense down the field on the ensuing drive, making a reception and scrambling for 31 yards. 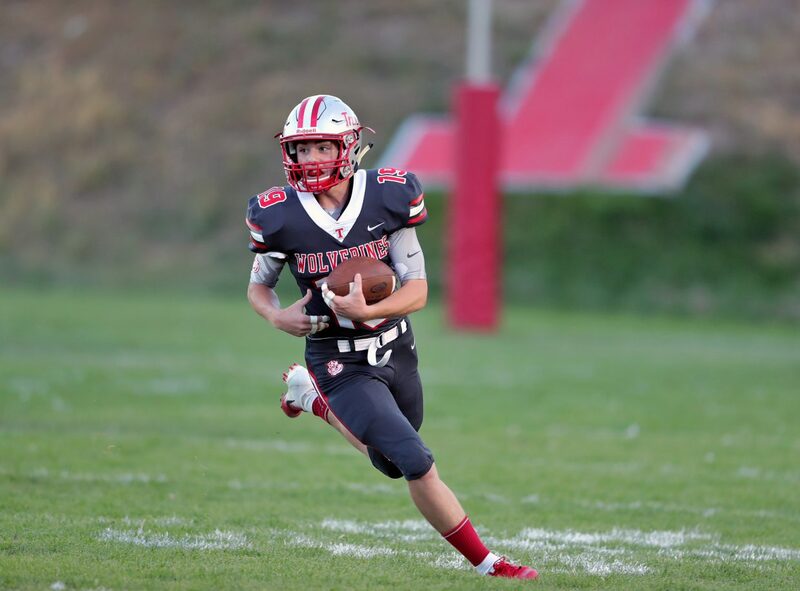 The Wolverines finished the drive and a solid half on offense with a 3-yard touchdown pass from Bellon to senior Kevin Malo, giving the team a 21-10 lead. 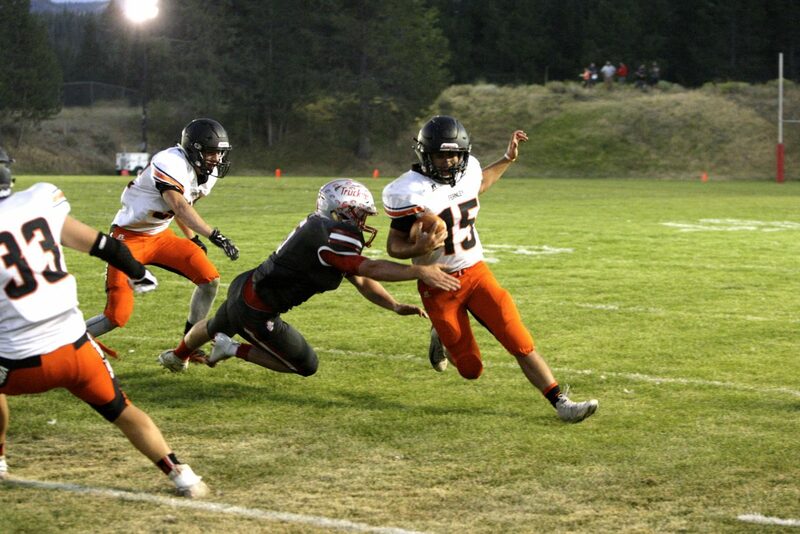 Malo nearly scored again to start the second half, breaking free for a 35-yard run down to the Fernley 14-yard line. 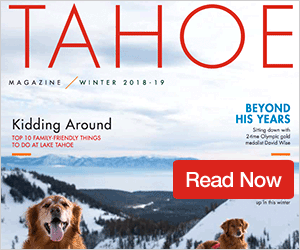 The Vaqueros defense would stiffen in the red zone, forcing a fourth down, but a Truckee conversion would lead to a short touchdown run up the middle by Bellon and a 27-10 lead after the missed extra point. Senior linebacker Drew Wingard highlighted the next drive, again showing there would be little to no room for Fernley to run the ball with a perfectly timed blitz up the middle to blow a play up in the backfield. 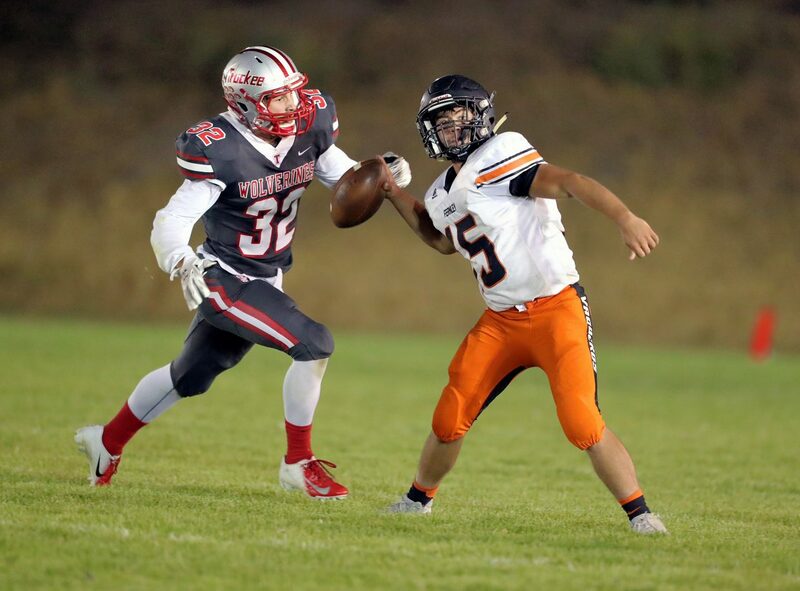 Fernley would find some success through the air on the drive, connecting on a pair of deep passes, but a fumbled snap cost the Vaqueros possession on the 20-yard line. 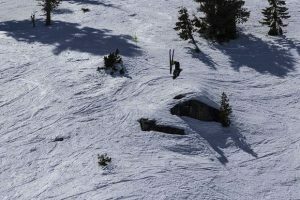 With a chance to put the game away, Truckee would give the ball back, fumbling on the following play to keep Fernley’s hopes alive. The turnover would lead to a short touchdown run, cutting Truckee’s lead to 27-17. 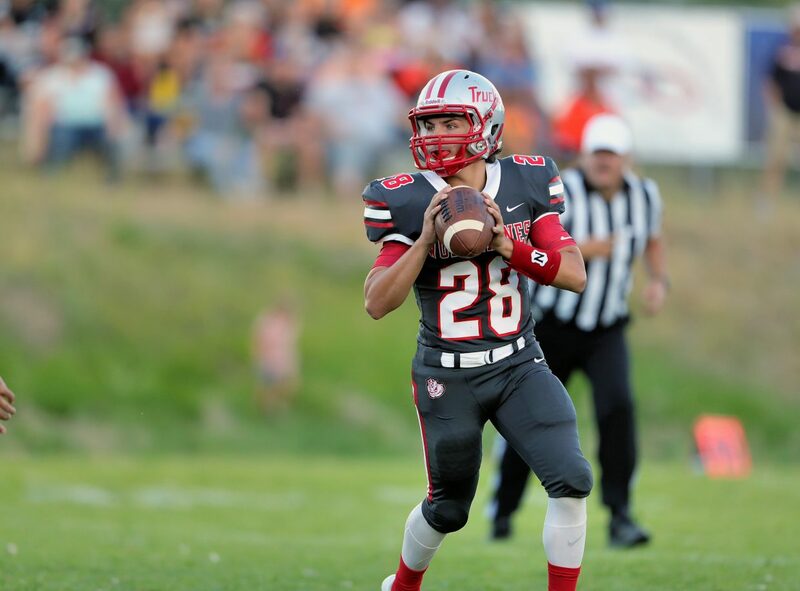 After forcing a punt, the Vaqueros again went on the move, driving into Truckee territory. 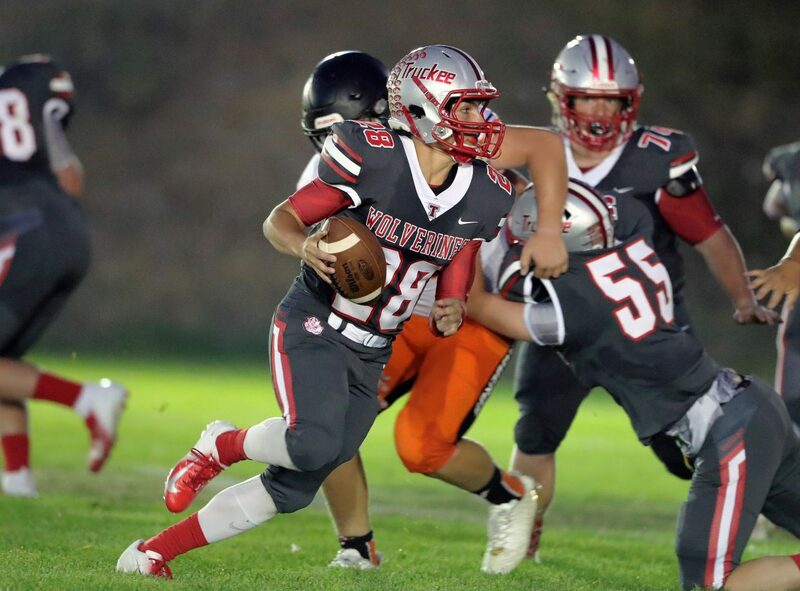 The Wolverines defense answered with a momentum-changing stand, which included a sack for a big loss by senior defensive end Stephen Ryan and pressure on a fourth-and-10 play by Trotter that led to an interception by senior linebacker Jake Bullion. 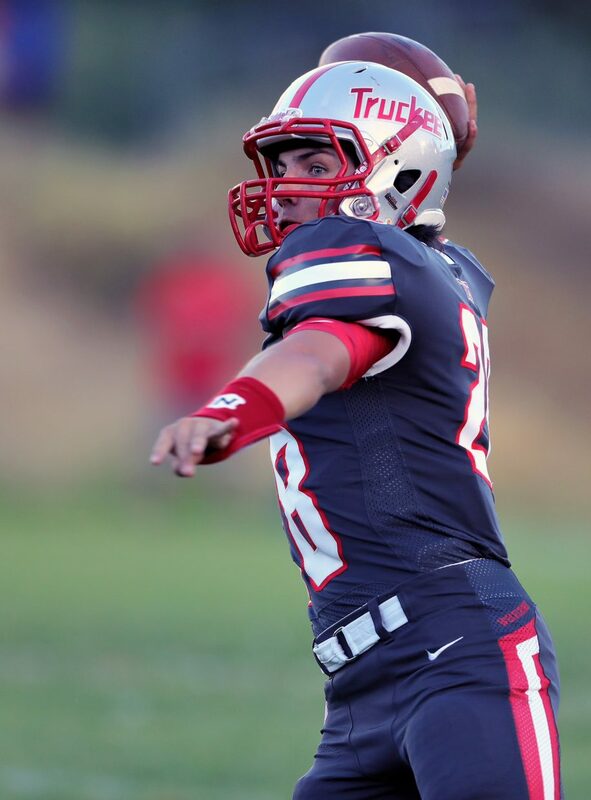 Truckee’s offense would score the final points of the night on the next drive, going 56 yards in less than two minutes. Senior Jackson Skaff capped the drive with a 2-yard touchdown run. 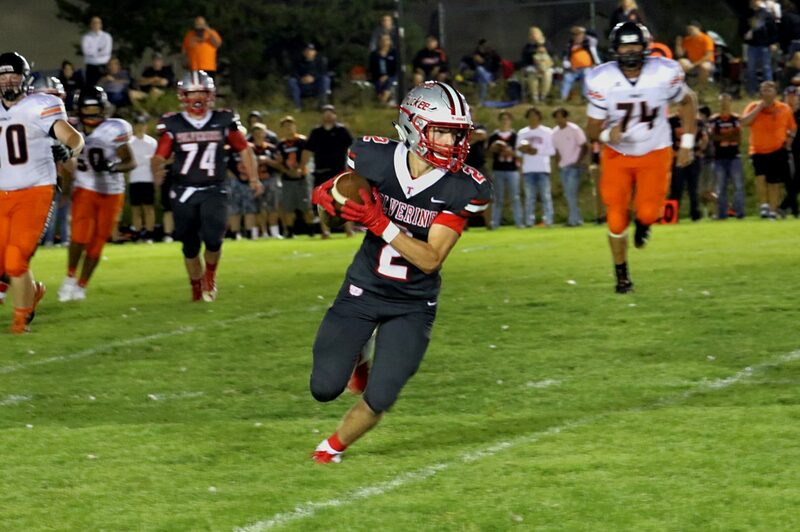 Truckee forced a punt on the next drive, but again fumbled the ball back to Fernley. The defense again rose up, making a stop on a fourth-and-1 play at their own 37-yard line. 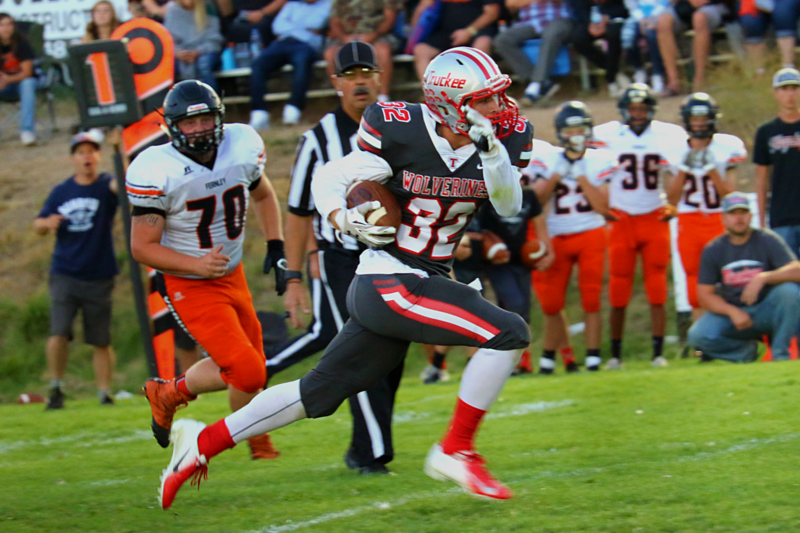 From there, the offense was able to kill the clock to get the win, and gain some revenge for the two losses Fernley handed Truckee last season. 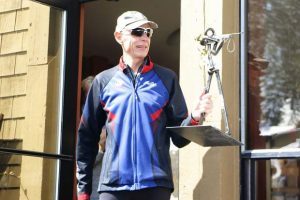 “I talked to some of the alumni, some of the seniors from last year, and they said it felt so good that we got them,” said Wingard. With a 1-0 start to the season and league play behind them, the Wolverines will next host nonleague opponent Bret Harte. 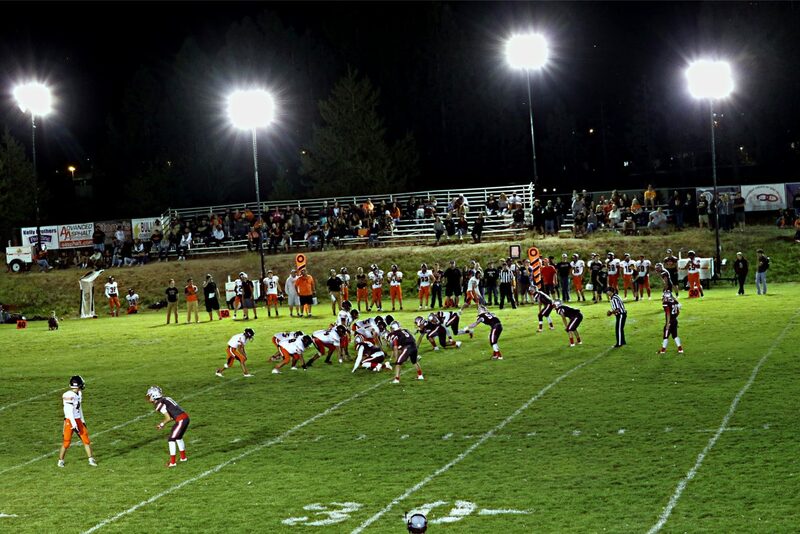 The lights will remain on at the field for the game’s kickoff on Friday, Aug. 24 at 7 p.m.